the safety of all pupils and staff"
Teachers in Birmingham are to begin industrial action on Friday after governors overturned a decision to expel a boy who allegedly threatened other children with a knife. Teaching union NASUWT said teachers at Saltley School would boycott meetings and refuse to do extra work. However, a spokeswoman said staff would continue to teach classes. Police attended an incident involving a pupil and knife on 22 May but officers chose to take no further action. A teenager was permanently excluded but the decision was overturned by governors. 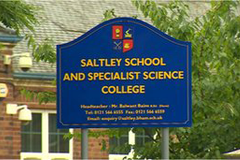 Saltley School headteacher Balwant Bains has said he has "total confidence in the safety of staff and pupils".